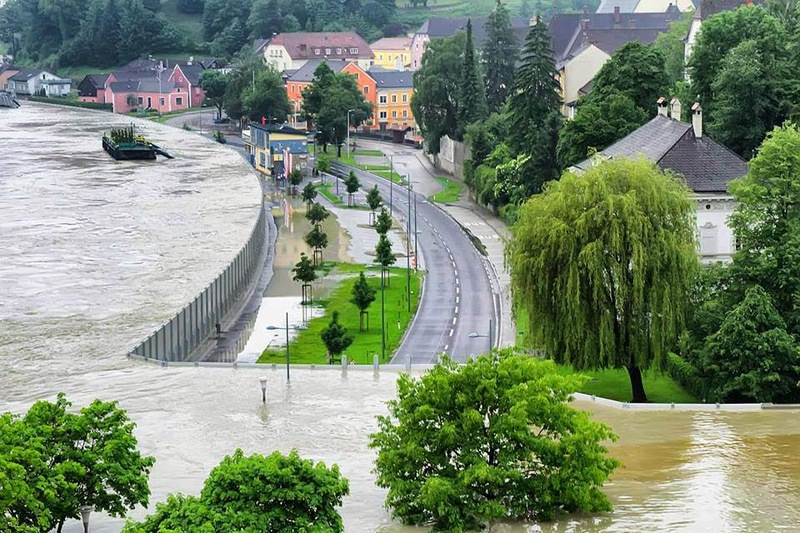 Regular Floods and landslides brought on by the River Danube prompted an emergency declaration in three Austrian regions, and a number of railways and roads were blocked. The solution was the Austria/Slovakia High water rescue system. Since the system was implemented in 2009 there have been no reported deaths or missing people due to the floods and the flooding authorities have managed to control the River Danube, reducing the flooding admirably. Though some areas have reported improved conditions, flooding continued across Central Europe on Wednesday after days of heavy rainfall, forcing tens of thousands of people to evacuate their homes. Flooding caused by sustained heavy rains has been reported in Austria, Switzerland, Poland, Slovakia, Hungary, and Germany with the overall death toll rising to at least 16. Four people have been reported missing. In the eastern German states of Saxony, Saxony-Anhalt and Brandenburg, many cities along the Elbe and Saale rivers and their tributaries were inundated with high water, putting a major strain on dikes and dams. The situation was particularly critical in the Saxony-Anhalt city of Halle, where some 30,000 residents were ordered to evacuate as a precautionary measure as water levels reached their highest in some 400 years. The city faces "acute danger" from the flooding, a city spokeswoman told news agency AFP. With the floods headed north from downriver in the neighboring Czech Republic, officials in cities along the Elbe expect water levels to peak on Thursday. In the baroque city of Dresden, the high point could approach levels seen in the disastrous flood of 2002, which caused widespread damage in eastern Germany and neighboring countries. About 1,000 people have already been evacuated from danger zones around the city, where emergency workers are stacking sandbag barriers against the rising water and electricity was shut off as a precautionary measure in some places. Though the water has already begun to recede along the Danube River in the southern state of Bavaria, which was hit hard by flooding earlier this week, two dikes broke near the town of Deggendorf, trapping people on their rooftops, where they were rescued by helicopters. Four farmers caught by the rush of water managed to cling on to their tractor until they too were plucked up by a helicopter. A fire fighter told news agency DPA that was a "life-threatening situation." In the Czech Republic, some 19,000 people have reportedly been forced to leave their homes due to the flooding. High water arrived unexpectedly quickly overnight and is expected to continue rising in the industrial city of Ústí nad Labem, according to reports. In Melnik, where the Elbe meets the Vltava River, water levels have come within just centimeters of breaching a dike, where people have been feverishly stacking sandbags to stave off the deluge. In the capital of Prague, the subway system remained closed on Wednesday due to flooding, though water levels had begun to recede. On Tuesday, officials there were also forced to evacuate the Prague Zoo and closed the famous Charles Bridge as a precaution. German military troops and federal disaster workers have been called to help affected communities handle the flooding in eastern and southern regions of the country along the Elbe, the Danube and their tributaries. And on Tuesday, German Chancellor Angela Merkel pledged €100 million ($130 million) in swift aid for those affected. The announcement came after the chancellor assessed flood damage on Tuesday in the Bavarian city of Passau, which has seen its worst flooding in some 500 years. By Wednesday, the high water had begun to recede in the "City of Three Rivers," where residents were starting to assess the damage. "We are slowly coming out of a disaster situation to experiencing just high water instead," a city spokesperson said.